Recently I won a give away at pari's place and it was the first give away which I ever won after I started blogging and that is why it is really special to me.I won a book named 'Pure and Simple' by 'Vidhu Mittal',which is really a very well written book with wonderful recipes.This book is quite an essential for a newbie in kitchen as it covers almost all from basic stuff to the creation of a exotic meal and I must thank Pari for choosing such an excellent book for the give away.Today's recipe is prepared from this book and you will see many more recipes from this book in my space soon,so stay tuned!!! 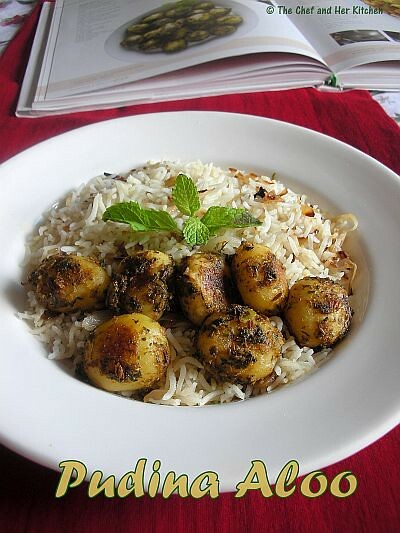 Coming to the recipe,this is a really simple but flavorful recipe and potatoes do wonders in absorbing the flavors of any dish.I like to use baby potatoes in my cooking very often and I have already posted many recipes using baby potatoes and now even this recipe added to my list.If you have boiled potatoes in hand this entire process can be finished in 15 mins.This dish can add charm to your dining table and is a good side dish with roti or pulav or you can even serve it as an appetizer. Pressure cook baby potatoes for 1 whistle and simmer for 5 mins and switch off the flame.After the pressure drops,drain and cool the potatoes and peel the skins off. Heat oil in a pan and add hing and crackle cumin seeds. Add ginger paste,green chilli paste and mint paste and fry well. Add coriander powder,red chili powder,amchur powder,mint powder,chaat masala and garam masala and fry well for 5 mins stirring it occasionally. Add finely chopped mint,coriander leaves and salt to taste and mix and cook for a minute. Serve it hot as a side dish with roti/pulav or as an appetizer.I served this with Jeera rice and Masoor Makhani and it was really a satisfying meal. The usage of dry mint and fresh mint in large quantities makes it extra tasty,so do not skip adding dry mint to it. To make dry mint powder,clean,wash and drain excess water from mint leaves and dry them under shade/sun for a day or two.Powder it in a mixie,if the leaves are still soft and not crisp microwave them for a couple of minutes by checking them in between and then powder them. I like my potatoes crisp,so I poked the boiled potatoes a bit with a fork and shallow fried using a tsp of oil until crisp and form brown patches all over and added to the dish instead of boiled potatoes.However it is optional and left to your choice. Mine did not turn very green as I did not have much mint while making it and also I added a pinch of turmeric to baby potatoes while frying.If you follow the process I mentioned the potatoes will turn quite green in color with lots of mint flavor in it. Looks Yummy !! Prathibha, I love all you pictures too :) Thanks for sharing. 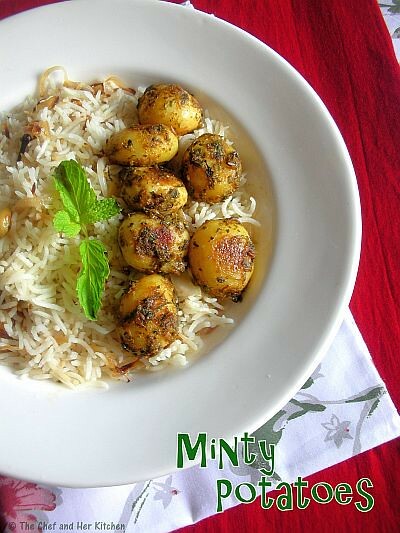 Thats a nice recipe with this combo of mint,potatoes with anything will taste awesome! Love the pictures! Nice post and great style of posting. Wow! this sounds so flavorful. 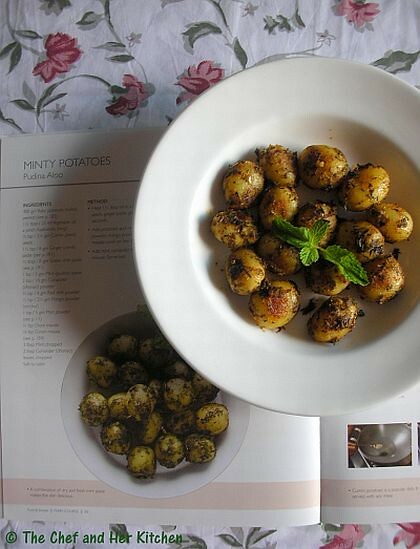 I also made minty Potatoes but a totally different recipe! A keep for sure! yummy n perfect with pulao!! Congrats on your win.... i love that book.. nice collection of recipes. Looks so minty and yummy Prathi. Perfect for Pulaos. I am SOLD!! Am sure this tastes fabulous, makes a fabulous appetizer. Keep more coming!! Pudina Aloo looks tempting and awesome, Pratibha..Congrats on tour win..
wow so so yummy.. i love it.. Very difficult to differentiate between the reel and real. Both your click and the one in the book look so alike and beautiful. Good for you to capture it like wise. I too make a chaat of this which you can find in my space. Love mint and baby potatoes. Perfect combo. Mint and potatoes go so well together delicious. Those minty aloo look so cute and lovely. Would you please pass me that platter, it looks so delicious. Congratulations on winning the book. That looks so easy to make & very flavorful. Tempting indeed! These look awesome. Flavorful and lovely. 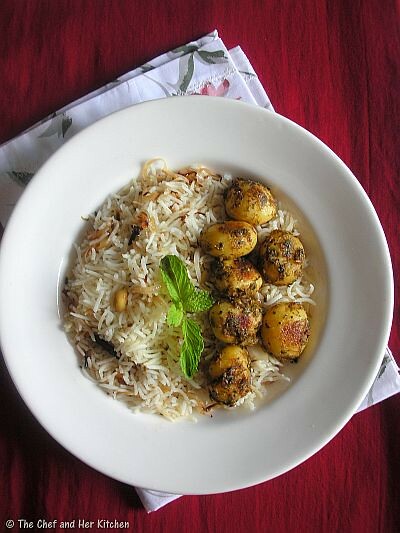 I am yet to try the baby potato biryani and here you are with another potato dish.Looks spectacular and congrats on winning the giveaway! So pretty to look at and so tasty. Looks perfect and delicious. I love mint with anything. Congrats. Nice twist adding mint paste and dry mint powder.. sounds different.. must have been very tasty.. 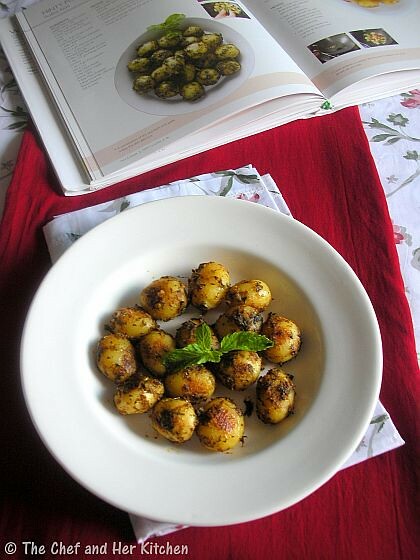 I gave a try with Potatoes and curry leaves some time back.. Would love to try this soon.. By the way, awesome clicks.. The potato preparation looks yummy. Looks very tempting. Love the cute potatoes. 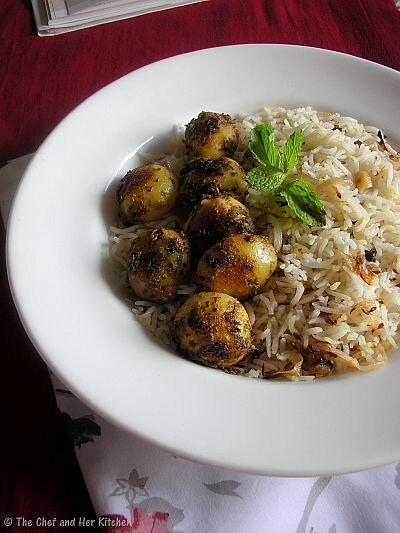 Made this recipe for lunch with jeera rice and dal fry....very tasty. Thanks . @Ashwini...Thanks for the feed back..Happy 2 know that u enjoyed ur meal.. It turned outtasty.However the potatoes were kind of bland inside and also did not have enough salt t the center .I had added salt while boiling &shallow frying the potatoes. Are you aware of any technique to get the potaotes absorb more salt as in the case of baby potaotes we consume it as a whole.Thanks .